The addition of fluoride to most municipal water supplies has become a growing concern for many families. 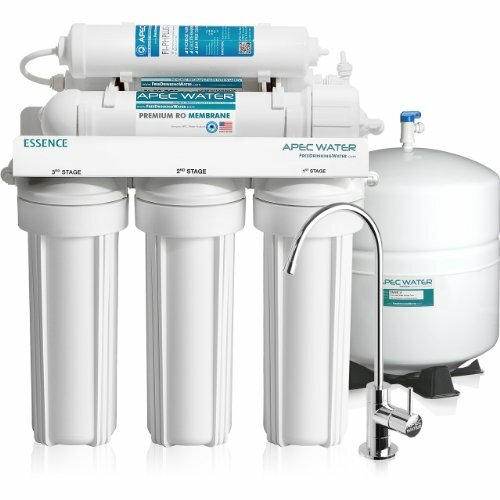 Since many people use reverse osmosis systems in their homes, one question that comes up is does reverse osmosis remove fluoride? In most cases, yes. RO membranes are very effective at removing contaminants and fluoride is is one of them. The semi-permeable membrane in RO filters does not let the fluoride ion cross. Fluoride is an ionized form of the element Fluorine, which is one of the most reactive elements known to man. When Fluorine gains an extra electron, it becomes electronegatively charged and becomes fluoride. Fluoride is added to municipal water supplies in the United States, Canada, and elsewhere. You may have noticed that there is a little line of text on your toothpaste that says “Fluoride Toothpaste”. When fluorine is added to water at a ratio of 1 part per million, it has been shown to prevent tooth decay. However, there has not been any significant scientific study on prolonged exposure to fluoride, and generally speaking, a concentration of higher than 4 parts per million can cause health problems like tooth discoloration. The ADA(American Dental Association) maintains that the trace amount of fluoride added to municipal water has shown to cause 25% less cavities. Before teeth erupt, fluoride dissolves through the gums into the teeth and helps strengthen tooth enamel so when they do erupt, they’re stronger. After teeth have erupted, fluoride helps to strengthen the tooth enamel and prevent cavities. This won’t be so much from the water you drink as from the toothpaste you use in brushing your teeth. According to the ADA, excessive fluoride consumption in children can cause fluoridosis, which is a mild discoloration of the teeth. In most cases, this is barely noticeable unless you have a trained eye. The US Surgeon General, the Center for Disease Control, the American Medical Association, the American Academy of Pediatrics, and the American Dental Association have all vouched for the use of fluoride and its benefits. Recently there has been a lot of attention towards fluoride and many people are citing negative effects on health. However, it should be noted that the health issues were caused when fluoride was in excess of the recommended 1 parts per million. Extreme cases of skeletal fluorosis are very rare and though they have serious effects, they’re only found in areas of unnaturally and excessively high levels of fluoride, such as mines or areas where fluoride-containing coal is burned. In most cases, no. Municipal water supplies are usually well controlled(unless you live in an area like Flint, MI in which case you need to get an RO filter or distiller) and the low amount of fluoride in the water supply would have been found in natural water anyway. 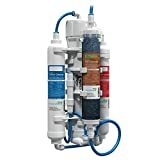 If your home gets water from groundwater and you live in an area with high levels of fluoride, then it is a good idea to use an RO filter to remove the fluoride. However, if you wish to err on the side of caution, you can certainly get an RO filter and filter out any fluoride right before consuming water. Unfortunately the debate about fluoride has become so polarized that government agencies will not clearly state the potential dangers of over exposure to fluoride – though this may be because it’s very hard to get an overdose of fluoride from just drinking water itself. Most toxic cases related to fluoride were from sources other than drinking water, as you saw above. Children are a lot more susceptible to fluoride overdose than adults, which is why you’ll see fluoride toothpastes with a warning stating that children should never use toothpaste unsupervised. Even when they do use toothpaste, it must be a really tiny amount to prevent them from unnecessarily swallowing any. Adults should also not swallow toothpaste because of the potential fluoride overdose risks posed. 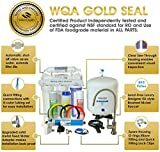 As you can see, RO systems are quite effective at removing fluoride and if you have concerns about it, you can use a filter to prevent any fluoride from getting into your drinking water. Even if you had zero fluoride intake from drinking water, you could still potentially get the benefits of trace amounts of fluoride from various foods as well as the topical benefits from using fluoride toothpaste.